The phrase “more fun than a barrel of monkeys” has always seemed a little ironic to me. I was ten years old when the game came out, but the commercial didn’t convince me. The kids did seem to be having fun, but that monkey? Nope. Wasn’t buying it. Even one cute little monkey can be trouble enough. Ask the Man in the Yellow Hat. Before George’s PBS makeover, that is, when curiosity still had a down side. Apparently I’m not the only one with this issue. Ted Nesbitt over at AllExperts.com has given a pretty good summary of the history of the phrase. He notes that the Oxford English Dictionary finds variations as early as 1840. It has a container, and it has monkeys, but where’s the alleged fun? The second example, from a December 1889 issue of Harper’s Bazaar – “My brother…says the American girls are perfectly fascinating… He says they are more fun than a box of monkeys –includes all the salient elements, and amuses me as well. Why “more fun than a barrel of monkeys” replaced the phrase “more fun than a box of monkeys” is unclear, but it did. Peter Jensen suggests a number of plausible reasons, but concludes that a barrel of monkeys just sounded – well, funnier. From Wallace Edwards’ second collection of illustrated idioms, The Cat’s Pajamas (2010). 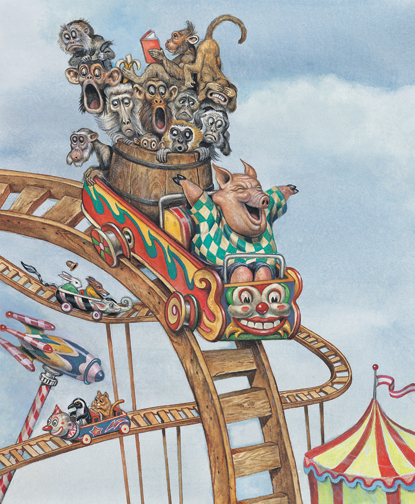 Nesbitt suggests that the meaning of “more fun than a barrel of monkeys” has gradually changed. Yet the OED citations make it clear that the phrase has always implied its opposite. We want to believe irony is a post-Modern invention, of which our forebearers were all blissfully naïve. But language itself is a barrel of monkeys – mischievous, messy, multivalent – and it says otherwise. As did Dave Garroway – the first host of NBC’s Today show. The Today Show did not do well in 1952, its first year. When advertising executive Pat Weaver saw a baby chimpanzee on the Perry Como show, he decided that chimp was the ticket to boost revenue and increase ratings. And it worked. 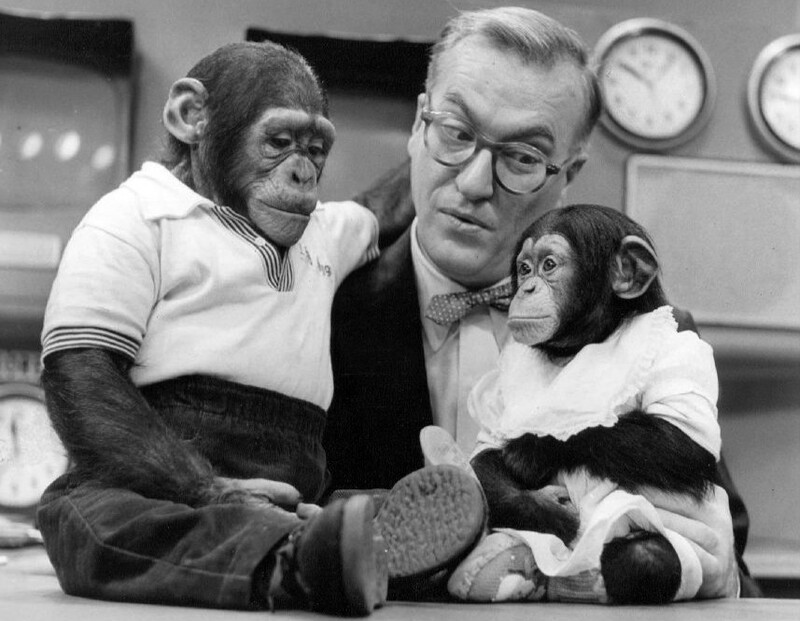 So from 1953 to 1957, Garroway had a simian co-host, J. Fred Muggs. At the press conference announcing his addition to the show, Muggs yanked Garroway’s tortoise shell glasses off. He became an instant hit. And news became entertaining. Advertising Age reported that over the course of his career, J. Fred Muggs made NBC 100 million. But the older and stronger Muggs got, the more difficult the chimp became. According to Gerald Preis, son of the chimp’s handler, “Mr. Garroway grew jealous and began spiking Muggs’ orange juice with Benzedrine to make him misbehave and deliver his human co-host back to center stage.” Despite Garroway’s addiction to prescription drugs and to liquid Benezdrine, which he carried with him everywhere, this seems unlikely. The person who suffered most when Muggs misbehaved was his co-anchor. During the chimp’s tenure, Garroway made almost two dozen trips to the NBC dispensary for tetanus shots. Garroway famously took it upon himself to show his audience just how much fun a barrel of monkeys could be. He had not one but three barrels crammed with live monkeys brought unannounced into the studio. When he took the lid off, all hell broke loose. .. The chimps went completely berserk. In seconds, the set became one big monkey toilet, littered in crap. I quickly leaped up on the desk, adrenaline-boosted gymnastics given the dress I was wearing. Some holdouts were still in the rafters when I left. Sadly, I was told later they had to shoot them to get them down. Was this, as Henderson suggests, just another “wacky idea” of Dave Garroway’s? – influenced perhaps by the uppers and downers he carried with him in a black leather case, washed down with a solution of liquid Benzedrine he called “The Doctor”? Maybe. Or maybe he was just getting even. 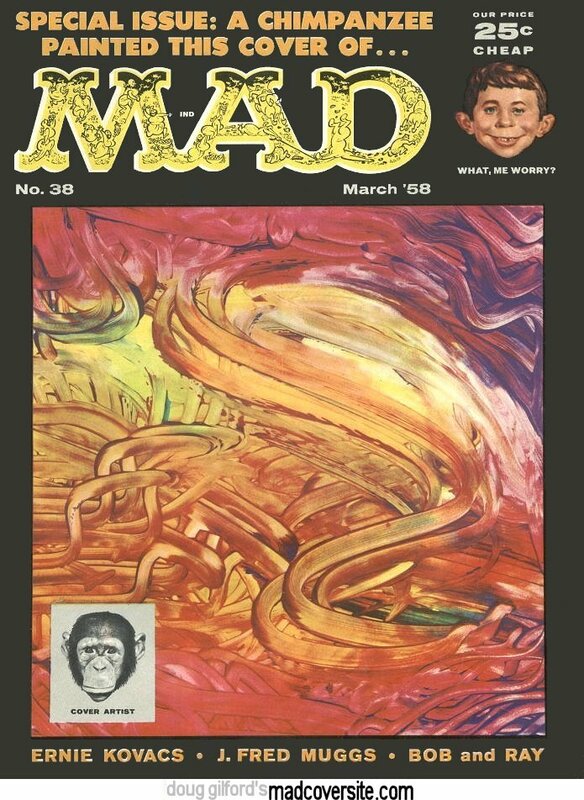 The first and last piece of cover art J. Fred Muggs did for MAD Magazine. Muggs bit editor Al Feldstein, and never worked for Mad again. Interesting, as ever, Paula, although I don’t think we use that phrase so much on this side of the Atlantic (although I wait for one of my compatriots to correct me). I do remember the game, although we probably didn’t have that advert over here, but what struck me most was how the little boy got to do the action while the little girl cheered him on – wouldn’t want to give the impression that girls can use tools (like monkeys)! Round here there is an expression that’s potentially related – mad as a box of cats – but I haven’t been moved to research its origins. Yet. It is fascinating, Jann. Rumor has it he bit Martha Raye on the elbow when she was a guest, though the handler’s son vigrously denies this. However, immediately after Raye’s appearance they sent J. Fred on a “world tour.” The Russian newspaper, Izvestia called him “a symbol of the American way of life”, necessary to distract Americans from news about rising taxes, and decreasing pay. They skipped Great Britain, apparently, because the Brits were still mad that commercials featuring Muggs interrupted the (pre-recorded) coverage of Queen Elizabeth II’s coronation when it was shown in the United States. Some monkey business, huh. I would have bitten Martha Raye too. She was so annoying. Let this be a lesson to us all. When we become major tv stars, we will do so without harming any animals. A Barrel Of Fun! Love the post..